Tirto Waluyojati Pool is located in Klepu village, Sooko district, that is located approximately 30 km next east the Ponorogo city. 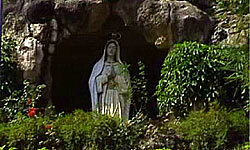 This tourism object is one of the pilgrimage places of Catholics in Java island to honour Mother Maria. On May 27 1988 by Mrg. A. J. Dibjakaryana, the Surabaya Bishop declared it named “Sendang Waluyojatiningsih”. As the pilgrimage and praying, Maria Fatimah / Sendang Waluyojatiningsih cave was completed with the Field of Praying place, the road which headed towards the pilgrimage place, Stasi Church, Holly Sacrament Church and Maria Statue from Fatima. Compared with Maria Lourdes, Puh Sarang cave pilgrimage, the nature in Klepu is very supportive, very beautiful, with the pine forest background, original water pool. 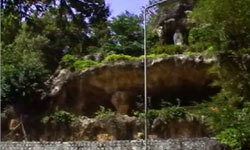 Beside have pilgrimage, the visitor also can go to Ngebel lake that not far from the pilgrimage location.